The first part of a new video documentary “featuring “tons of footage and information” about LEAVES’ EYES new album, “Sign Of The Dragonhead”, can be seen below. Released on January 12 via AFM Records, the disc was produced by Alexander Krull at Mastersound Studio and it features cover artwork by Stefan Heilemann (LINDEMANN, EPICA, KAMELOT). 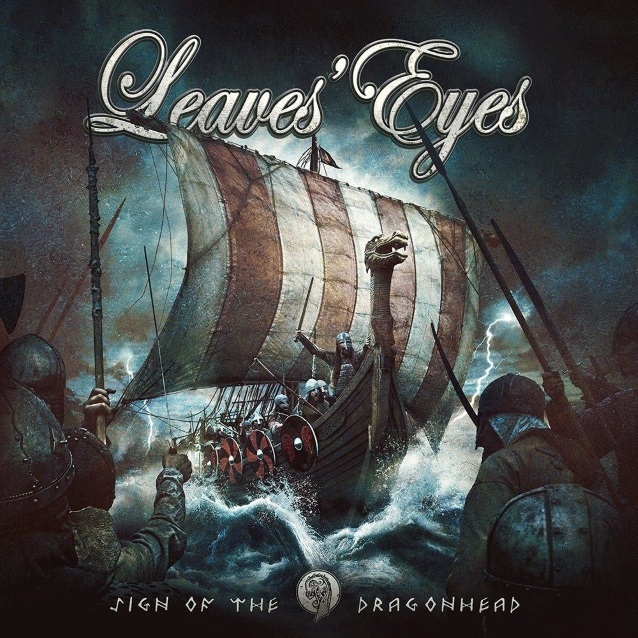 “Sign Of The Dragonhead” is the first full LEAVES’ EYES album featuring singer Elina Siirala, who joined the band in early 2016 following an acrimonious split with the group’s original frontwoman, Liv Kristine. Liv was previously married to LEAVES’ EYES‘ co-vocalist Alexander Krull. On “Sign Of The Dragonhead”, the chronicles of the Vikings is continued and reveals that the band have honed their strengths even further. At the same time, musical surprises have raised their sound to a new level. The title track is a raw number featuring martial choirs and forges a sonic arch to “King Of Kings”, continuing the adventurous journey of King Harald I. Frontman Alexander Krull and virtuoso guitarist Thorsten Bauer prove to be ingenious masters when it comes to composing haunting metal hits. Every track has the musicians upping the creative ante, revealing an impressive amount of diversity without neglecting their trademark sound elements. “Across The Sea” evolves into a metal shanty with an irresistible rhythm, bound to be a definite neckbreaker. “Like A Mountain” sets to music a tragic Icelandic love saga and surprises as a bass-heavy goth rock track. An emotional song with plenty of tough elements which allows Elina to reveal the full range of her vocal skills. Confident and autonomous, her classically trained voice takes possession of the songs — gentle at times, powerful at others — lending a highly individual note to her interaction with Alex‘s growls. LEAVES’ EYES has succeeded in creating compositionally complex yet tangible tracks. Perfectly coordinated instrumentation — never top-heavy, always unconventional. Medieval nyckelharpas, fiddles, uilleann pipes and whistles blend naturally with the metal guise, creating catchy songs such as “Shadows In The Night” and “Völva”, which whisks its listeners away to the mythical world of the seeresses and sorceresses of the Northern countries. Nobody expected a song like “Riders On The Wind”, which has classic heavy metal and Celtic folk clash to create an acoustic Viking party. These musicians’ deep affinity with the Viking era is revealed on “Jomsborg” about the legendary fortress and its Baltic Viking army, where in fact Alex‘s ancestors hail from. LEAVES’ EYES and Kristine have offered different accounts of the circumstances behind their breakup, with LEAVES’ EYES claiming the decision to part ways was amicably made in January 2016 and Liv saying she was dismissed from the group in April 2016.